1. Nolan Maier, Saskatoon Blades: The Saskatoon Blades goaltender stopped 43 of 44 shots Wednesday as his team pulled even with the Prince Albert Raiders in their best-of-seven series. Maier stopped 21 shots in the first, 13 in the second, and nine in the third for the victory. The Yorkton, Sask. product is now 6-2 in the 2019 WHL Playoffs, sporting a 2.15 goals-against-average, a .927 save percentage, and one shutout. 2. Max Gerlach, Saskatoon Blades: The Saskatoon Blades forward recorded a goal and two assists as the Blades secured a 4-1 win against the Prince Albert Raiders Wednesday night to tie up their best-of-seven series 2-2. Gerlach scored the Blades’ first goal of the game, then earned primary assists on their second and third goals of the night. 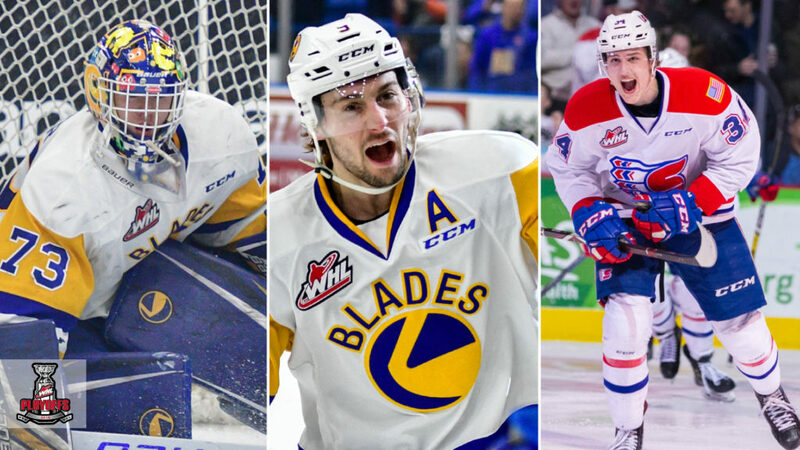 The Flower Mound, Texas product has eight points (6G-2A) in eight games during the 2019 WHL Playoffs. For his WHL Playoffs career, Gerlach has 17 points (11G-6A) in 19 games between the Blades and Medicine Hat Tigers. 3. Adam Beckman, Spokane Chiefs: The 2019 NHL Draft prospect and Spokane Chiefs rookie forward recorded a goal and an assist as the Chiefs took a 3-0 series lead with a 3-1 win against the Everett Silvertips Wednesday. Beckman scored Spokane’s second goal of the game and drew a secondary assist on their first goal for the lone multi-point effort in the contest. The Saskatoon, Sask. 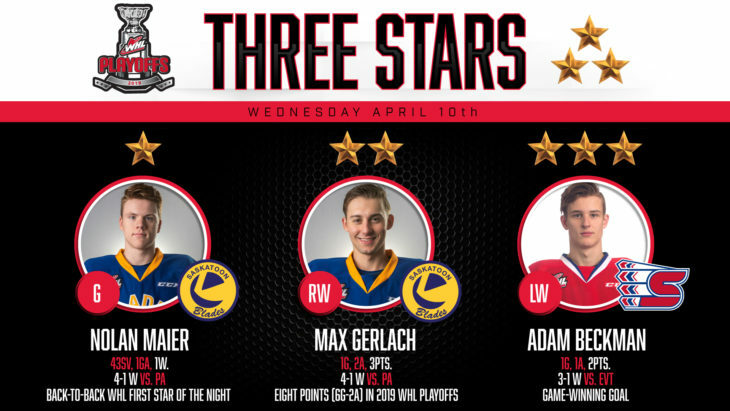 product has eight points (4G-4A) in eight games during the 2019 WHL Playoffs.